Manila, Philippines - Team Lea's young artists kicked off "The Voice Kids" Philippines Battle Rounds on Saturday, June 28, 2014. 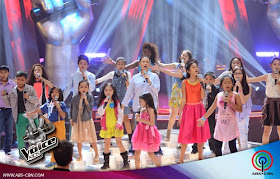 At the opening episode, Lea Salonga sang 'Brave' with her 18 young artists. It was a battle of vocals between Winston 'Ton-Ton' Cabiles, Genmarie Guiao and Angelico Claridad as they performed Rico J. Puno's hit song 'May Bukas Pa'. Coach Sarah was impressed on the consistency of Genmarie while Bamboo picked Tonton as the best among the paired artists. 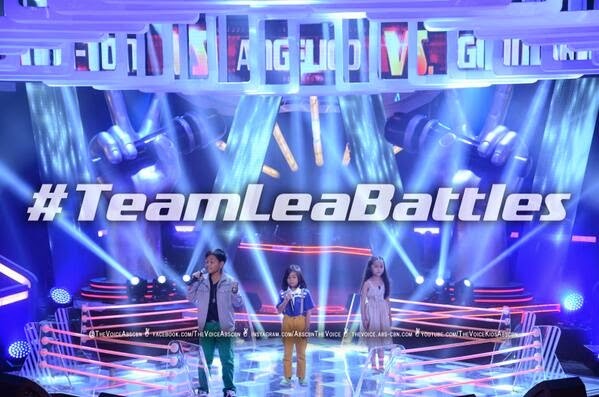 Coach Lea declared TonTon as the winner in the three-way clash. He will advance to the next round of the competition – the Sing-Offs. Other artists up on the battle stage this weekend are teammates Mariane vs Karla vs Darlene (“Firework”); Kobe vs Lorenzo vs Shanne (“Hey Soul Sister”); Giedie vs Angel vs Grace (“When You Believe”); Eufritz vs Coco vs Camille (“Love Song”); and Jimboy vs Angelique vs Rein (“Anak ng Pasig”). 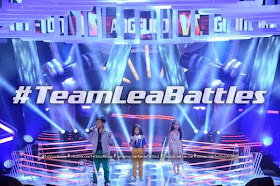 The first episode of The Battles on Saturday dominates online conversations with '#TeamLeaBattles' among the trending topics.